Learn how to identify and help prevent these injuries and learn when to get help. To understand computer related injuries requires an introduction to some of the basic terminology of musculoskeletal injury. Muscle spasm: excessive muscle tone; usually caused by a reaction to postural fatigue, tissue injury, or psychogenic stress. Strain: injury to a muscle or tendon (the tissue that connect muscles to bones); usually due to repetitive overuse, fatigue, over stretching, excessive contraction, unguarded movements, postural loading, or direct blows. overstress the tissues; another name for RSI is cumulative trauma disorder (CTD). Tendonitis: inflammation of a tendon; usually caused by excessive repetitive or abnormal motion. Sprain: injury to a ligament (the tissue that connects bones together); usually due to the same things which cause strains and the additional stress added when the muscles fatigue. Joint dysfunction: abnormal joint operation due to weak or lax supporting muscles or ligaments, or conversely excessively tight supporting tissues; dysfunction can result in pain, abnormal motion, and eventually degeneration and nerve interference. Cervicogenic headaches: headaches caused by irritation of the tissues of the neck by any of the tissue dysfunctions. To help prevent computer back try adopting the postural relief position every 20 minutes. “Mouse shoulder” (as good a name as any) is a syndrome arising from prolonged elevation and bracing of the shoulder to accommodate an inappropriately positioned mouse, or performing short range movements of the mouse, or (usually) both. This syndrome results in severe shoulder and shoulder blade muscle spasm (in the trapezius, deltoid, and teres muscles) and trigger points with referred pain in the arm. If left untreated, this problem can develop into a much more serious rotator cuff injury. For more information, see Carpal tunnel syndrome. Classic tennis elbow, or lateral epicondylitis, is another type of RSI. It is a tendonitis affecting the common extensor tendon at the lateral (outside) area of the elbow. Tennis elbow is a very common cause of elbow and forearm pain. It can cause mild to severe pain in the lateral elbow and may be aggravated by grasping and excessive finger motions. The pain may also radiate up the arm or down into the forearm. For more information, see Tennis elbow. 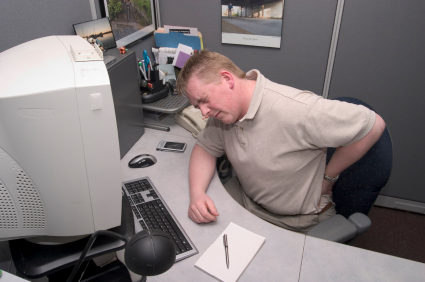 Lumbar spine sprains (ligament or joint capsule tears) and strains (muscle or tendon tears) are common in office workers due to the high loads placed on the spine during sitting. Sprains and strains may cause back and hip pain as well as muscle swelling and tightness. For more information, see Lumbar sprains and strains. Increased loading on the spine due to prolonged and faulty sitting postures may cause sprains of the outer (annular) fibers of the intervertebral discs. In more advanced cases the soft inner material (nucleus) of the disc may protrude into or even through the annular fibers of the disc, resulting in a herniated disc. Herniated discs may cause back pain, leg pain and altered sensation down to the foot, weakness, walking difficulties, or combination of these symptoms. For more information, see Disc injuries. Adopt proper sitting posture by changing the arrangement of your desk, chair, and computer screen and keyboard. See Office Ergonomics, Ergonomics: Good for Everybody, and Microsoft’s Healthy Computer Guide. Check yourself to ensure you maintain proper posture throughout the day. A good idea is to have someone else watch your posture while you work. Support easily compromised areas of the body. A lumbar support pillow and wrist supports for your keyboard and mouse can prevent many injuries. Don’t sit too long at your desk, get up and move around at least every half-hour. Also, try adopting the postural relief position every 20 minutes. Recognize that the psychological stress of your work could be altering your posture. Slumped shoulders and shoulders pulled upward are common self-defense postures. Improve your overall fitness level to make your muscles strong and flexible so that they do not fatigue as quickly. Start simple, balanced exercise program that you will continue, for example, brisk walking at lunch. Stretch and relax your tight (or overactive) muscles and strengthen and tone up your weak (or underactive) muscles. Periodically perform these simple stretches. See also these exercise videos. Take a few minutes to massage your muscles to help work out the kinks. Use gentle kneading motions and strokes towards the heart. At the end of your long day, relax your muscles in a warm bath or shower. You deserve it! Consider using a computer program like Workrave, a freeware program that assists in the recovery and prevention of RSIs. To quote the website: “The program frequently alerts you to take micro-pauses, rest breaks and restricts you to your daily limit.” It also provides helpful examples of stretches and exercises for you to perform during the breaks. Also consider using one of the many posture apps available for smartphones.